Parts V-VII: Thunderbox and The World’s Most Barbaric Metallic Benihana. 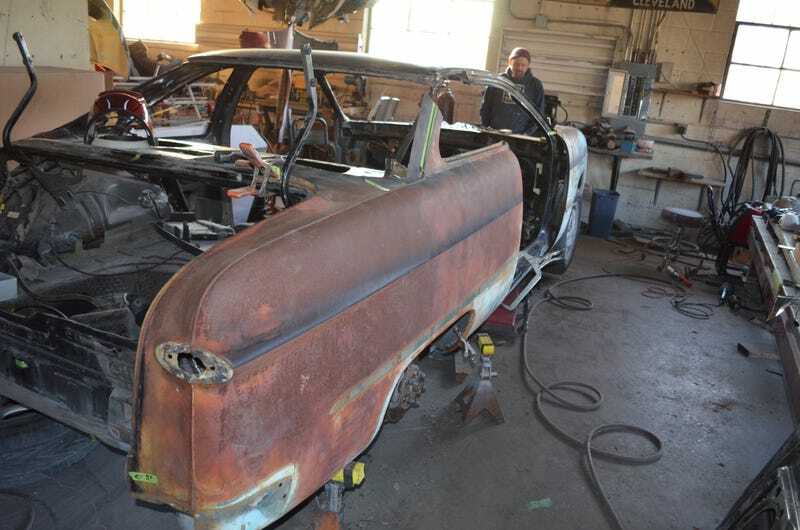 Guess what boys and girls, its time for another installment in the series of foibles and folly with a project I’ve dubbed the Thunderbox wherein my father and I attempt to combine a 1993 Thunderbird supercoupe and 1949 Ford Shoebox. Grab some popcorn and use the restroom (not in that particular order), this is a long one. Believe it or not, removing the dash wasn’t as hard as you might imagine. About half a dozen bolts along the top and half a dozen along the bottom and you’re unbolted. Un-clip about a dozen crappy Ford two prong clips that always break, and your home free (that is if your home is a funky looking mass of foam, rubber, and un-painted steel). We will just set this aside until we need to jam the stuff up underneath the metal skull buster ‘49 dash. Things are starting to get interesting these days on the ol’ conglomeration. Soon after my last post about the project, we really went after the car. B- pillar was cut off in order to move it forward to meet the shoebox quarter panel approximately five inches or so. While I was at it I went ahead and cut out the inner reinforcement on the front of the quarter panel. Talk about panel gap for days. Trim the final vestige of the old quarter panel, check. Now for the quarter panel to be in the absolute correct position, we had to at least line up the front fender and doors to make sure we are level. My father marked a water line onto the v8 car and transferred that over to our parts we took off of the I6 car. Next it was time to cut the entire c-pillar off. Yes, you correctly heard the text that I typed. A quick brace with some angle stock and bam! Apply a small dash of air chisel and lightly pound with a 4 pound hammer and suddenly a quarter panel fits. On to the front fender! So how might one attach an old front fender to a car 44 years its junior? You do it with a die grinder. First the air box and battery had to be removed; both will get fabricated new positions. All the wires were pulled back from the front of the engine bay and the front was ready for its first visit to the world’s most barbaric Benihana. Time for a test fit of the fender and the shoebox upper core support. Nose was about 2-3 inches too high but that was a problem for another day. It was the end of the day and my dad was feeling extra good about how everything was shaping up and the fact that he “coincidentally” wore his Ford work-sweatshirt; photo-op it was. We went a quite a few days without working on the ol’ bird and I finally found a couple hours to work in the afternoon since I had all my customer jobs done. Bye-bye radiator and condenser, see you soon. Once again I embarked upon a journey of cutting and mutilation in the name of beauty. When will people stop applying unrealistic standards of beauty to old cars? Header panel still has to move down about an inch. I drilled out all the spot welds that held the core support in place and drilled a new couple of centering holes to position the new location. About an inch and a half down and three quarters of an inch back got the top of the core support in place for the header, but I still had to move in the bottom in. The biggest victory of the day was when I figured out that by moving the radiator towards the passenger side a little bit I was able to slide it in next to the intercooler instead of in front of it. That was just the inch I needed to find up there. It will be tight up there, but it will work. That’s how she sits. More to come, in the immortal words of every tv and radio newscaster ever, stay tuned.